The Watch dial design project is a full-fledged package for electronically picking & placing the selected index on different shapes of dials from a large database of different shapes & sizes of indices. 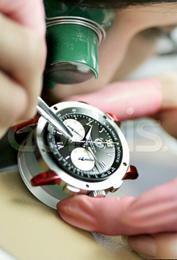 It has a database of all leading watch manufacturers & standard fitting dimensions of all popular watch calibers. It allows the user to select the finish, artwork etc. The product design is linked to tool design, tool drawings & profile charts, CNC coordinates. It also gives the information required by the planner. It is a useful tool for making complex shapes of ducts. It has the complete library of joints & fittings used for air conditioning & ducting industry. It gives the development of sheet & CNC coordinates for machining of the sheet. The unique feature of this software is that any computer literate can take the output & the user need not know creating geometry in 3D. It is a tool for mass conversion of all dimensions & text in inches to millimeters for any AutoCAD drawing. This is a tool for generation of tool drawings from product database. It generates 35 drawings for cold forging of watch cases. It is a software for parametric design of transformers & DC motors.